Spitzen – Eat Me. Drink Me. My great uncle had always been old. From the time I was young, he’d been the same Hansvetter – I remember him in a newsboy cap, a cigarette in his hand, his feet covered in slippers. He loved to watch the planes take off from Stuttgart airport. He lived nearby and kept his TV programmed to a bluescreen listing of departures and arrivals so he’d know which planes were heading where as he watched them fly into the sky. When I’d visit, he’d ask when I was leaving, what plane I’d be on and tell me he’d track me as I took off. Well, yes, we’ve been speaking it our whole lives. I drove to the South this weekend for Hansvetter’s funeral. On my way there, I thought of how our language and our dialect works to shape our selves. Such a large part of why I’m in Germany is to understand myself as well in this language as I do in English. Yes, Hansvetter, I grew up speaking German, but in a way, you’re right – it’s a foreign language to me still. And yet it’s personal. A whole half of my family is German, a whole half of me exists in another language. 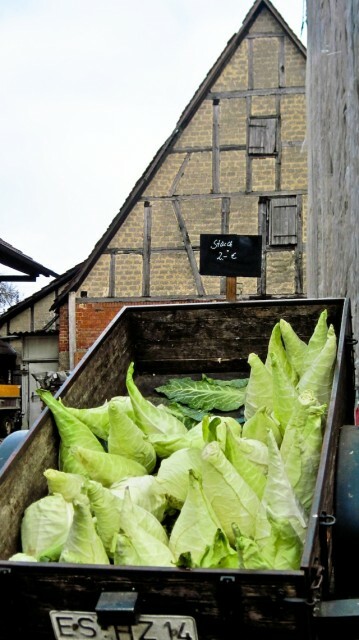 We drove to the cemetery, passing a giant trailer full of cabbages, and then another, and another. These were the largest cabbages I’d ever seen, round and full at the bottom and then spiraling up into a peak. Spitzkraut, it’s called, or Filderkraut, after the area in which it’s grown. But I prefer Spitzkraut. It reminds me of what Hansvetter used to call my youngest brother: Spitzbub, an impish boy. My middle brother had even said, when we’d telephoned earlier in the week, “It’s weird not to have someone calling Michael Spitzbub.” – as if Hansvetter had a monopoly on the term. The rough translation would be, “Buying Spitzkraut in the fall means winter saurkraut for all.” We bought a Spitzkraut and stuck it in the car before we went to the funeral. 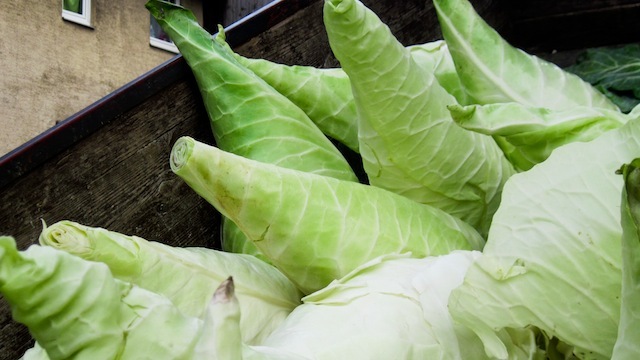 It might sound macabre, to take such joy in finding out about a type of cabbage I’d never seen before, right before going to a funeral. But I think Hansvetter would have appreciated my delight in the Schwäbisch saying on the sign, in a traditional Schwäbisch food. His grandfather, after all, had been a cabbage cutter. It was like having a dialogue with Hansvetter – we talked about words and dialects, about how what we speak makes us belong to a place. I forgave him for always asking if we could understand. Then, it seemed a bit insulting, but I suppose that for him, my brothers and I were wonders – we lived in America, spoke English, and yet could understand a dialect most Germans from the North can’t comprehend. My relationship to language is not an easy one – I am constantly reminded in Germany of how much I fit in and how apart I still am. But in memory of Hansvetter (whose comments always managed to bring up all my conflicted, complicated, defensive feelings about language), I made something simple. 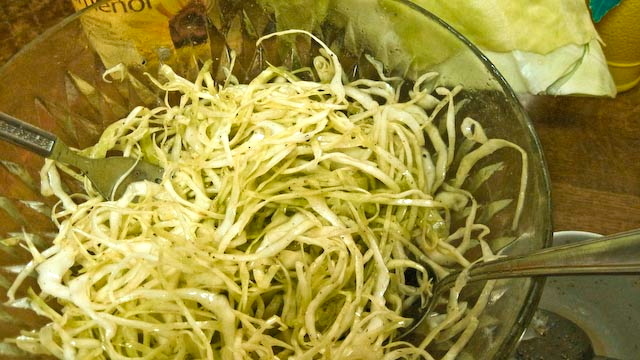 I took my Spitzkraut (thinking of Hansvetter calling Michael Spitzbub, how Spitz means point, pointy, top, the tip, peaked, how cabbage and children can be given the same prefix) and made a Krautsalat – just finely grated cabbage, vinegar, salt, pepper, oil, honey, and lemon. And that was enough. A beautiful tribute to a kind man. Bless your soul, Hansvetter. You show your soul when writing. This was a lovely tribute to Hansvetter, who would not have understood the English! This piece made my day. You have found a deep insight in such an ordinary scene: a cabbage truck. The scene, unremarkable in of itself, serves as a portal to a body of experiences that comprise something really profound. I strive for the same in my own writing and photography, and this piece is an inspiration to me. I am sorry for the loss of your uncle, but I am glad you were there, with a cabbage truck, to remember him.